Im looking for another action camera. My Gopro videos take up so much space on the computer. Why do they take up so much space, and how can I improve the quality of the videos? The camera is a Gopro hero 3+ silver. Welcome to the Photo Forum........ I don't know enough about those tools to offer any viable suggestions but I hope someone will swing by and offer you some suggestions. Speaking as a guy who has only used the gopro line of action cams, and nothing else, I think you are kind of asking an impossible question. You want higher quality videos, but using less hard drive? I don't see that happening in any camera. The higher the resolution, the more space it will take up. That goes for any type photography. In my opinion, the gopro takes amazing videos, but in todays world, you need a computer that will process those huge files, and of course, a hard drive that will allow you to keep them on your computer, plus another(at least 1) external for backup . In the big scheme, hard drive space is relatively cheap nowadays. Especially looking back on what it was 10 years ago. You can of course use a lower resolution on the gopro to save space, but the picture quality will go down. My opinion, keep the gopro, and buy a couple of 1TB external drives for about half of what the gopro cost new. 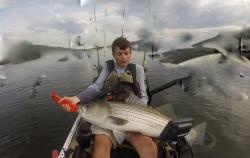 I still want a second camera for my kayak to get different angles. Im willing to sacrifice quality for smaller files. Something that operates remotely and has good low-light. And I do have an external 1TB drive. Its just annoying for me to work with footage on the drive vs. on the computer. I got the wild game innovations 5.0 action camera. It has great night vision and clips onto your hat. It's on amazon for like $90. Been using it for 5 years and it still performs excellent. I use Go Pro's religiously. I currently have mine mounted on my car taking videos as I drive. I use and external drive to store all the vids I wish to keep. To shorten the video files of a session, I set my camera settings to 12min increment. When I drive to the shore, which takes an hour, I will have 5 sets of short video capture of the whole trip down. It's faster to do video editing. Once you've edited all of your sets, you can combine them into one. I use go pro's video editing software to enhance the quality the recording. what are your recording setting settings on your camera?? ?